In this booklet I am very happy to be presenting one of the greatest of rarities, an account from the ranks. Thomas Jeremiah having already worked for a couple of years, joined the 23rd Royal Welch Fusiliers on 27th November 1812 at the tender age of 16, where he joined Captain HC Johnson’s 6th Company of the 2nd battalion which was on Home service. Although well educated Thomas does not appear to have ever risen beyond the rank of private and eventually left the regiment on 26th June 1837 with a pension. However, after leaving the army he became Chief of Police in Brecon, South Wales, being severely attacked on one occasion which left him lame for life. Rather ironic, having escaped injury during his army career. Although written when he left the army around 1837, Thomas’s memoirs (which are reproduced here with the kind permission of Llyfrgell Genedlaethol Cymru/The National Library of Wales; reference NLW ms 22102A) are fresh and honest and centre around a few particular incidents during his service life which were seared into his memory. He gives us a glimpse of army life for a private, warts and all and also gives an honest opinion of his fellow soldiers and officers. Of particular interest are his descriptions of the major commanding his battalion on first joining, who undoubtedly would have felt at home playing the baddie in a Sharpe novel! Flogging everyone in sight, including, to Thomas’s extreme disgust, a woman. Moving quickly to the Waterloo campaign, Thomas’s first venture abroad, he paints some very interesting pictures of regimental life, including forming a work party to level the roads before the great cavalry display for Blucher at Schendelbeke. He naively repeats the soldiers’ rumours of the time, such as the one assuring the reader that Napoleon was at this review disguised as a fruit monger!! Although in the 4th Division, most of which missed the Battle of Waterloo, being stationed at Halle; Mitchell’s Brigade consisting of the 1/51st, 23rd and 3/14 were at Waterloo deployed on the extreme right of the line the whole day. The exploits of this brigade at Waterloo are generally ignored by historians of the great battle, which is particularly hard on the 23rd who certainly played their part. Initially, this brigade was in the second line across the Nivelles road, watching for any hint of a turning movement on the extreme left wing of the French army. Soon after the battle commenced, some Guard battalions were sent down off the crest to bolster the defence in and around Hougoumont; when the 23rd were marched up to the crest behind Hougoumont, where they remained all day, ravaged by cannon balls, harassed by regular cavalry attacks and even infantry at one time. Theirs was to stand heroically and take this repeated punishment all day, with little opportunity of retaliation; knowing that they formed the cornerstone of the front line and that they must hold at all costs. Out of a force of 641 men at the outset of the battle, the 23rd suffered 5 officers killed and 6 wounded, 13 rank & file killed and 80 wounded, a casualty rate of 16%. Thomas gives much information regarding this fateful day; he dispels the myth that Wellington’s army didn’t maraud; nonchalantly describing how he joined numerous other parties ransacking nearby properties to find food and drink. Initially failing, he eventually found a flour cask which he promptly fell into; followed by the joyous discovery that most had failed to search the cellar of a great house near Merbe Braine which yielded fine wine and brandy (the only evidence of a previous visit being the bodies of two German soldiers who had drowned in their desire for wine), all topped off by finding the family silver, which they did not fail to liberate! Thomas must have looked a sight on returning to the regiment with his plunder and covered in flour, only to find himself nearly overwhelmed by his ravenous colleagues! Thomas gives a slightly confused but very interesting description of the actual fighting that day by an ordinary soldier. He mentions the 23rd Light dragoons fighting alongside his regiment and the inexperienced 14th Foot nearly being overwhelmed by a cavalry attack which they were ill prepared for, indicating that the fighting in this sector was more involved than the cursory glance most historians of the battle give it. 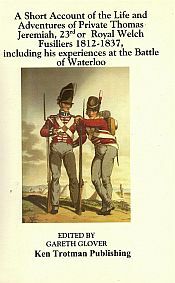 His account ends with the Battle of Waterloo although he remained in the regiment until 26th June 1837. He became Chief of Police at Brecon and died 10th April 1868; leaving his six children to share his moderate estate.